I love a good hot dog. I mean, who doesn’t? I was ecstatic a few years back when Moe’s Hot Dogs opened up on Gray’s Ferry Avenue, conveniently located between my then apartment and my parents’ house. Then there’s Top Dog in Rockport, MA, one of our go-to vacation spots, that has an extensive variety of dogs all named after, you guessed it, dogs! The only local place I have yet to try is THE authentic Philly hot dog place, Texas Wieners, on Snyder Ave. which is, ironically, just a few blocks from my house. But then came Hot Diggity. After hearing glowing reviews from folks such as this guy, who’s just a tad obsessed, we put it on our long list of places we wanted to visit. But 6th and South is kind of random. When are we ever in that neck of the woods??? That question was answered one Sunday after a late morning visit to Headhouse Farmers Market. We were both famished, having skipped breakfast for the market and were just not in the mood for any of the offerings there. A-ha, this was the perfect time for Hot Diggity. I pulled up the menu on my iPhone and started excitedly reading it aloud to my husband. I know I’ve got a keeper because not once did he interrupt me or tell me to be quiet. In fact, he was just as excited as I was for exciting offerings such as Cincinnati Skyline with chili, nacho cheese and other fun stuff. Luckily, after rolling down South Street, we found a spot right out front. He waited in the car with the dog while I hopped in line and checked out our options. We had decided to split three dogs and he let me pick, woo hoo, knowing that the Cincy Skyline would definitely be one of the choices. The line was short but the wait just to order was a little longer than expected. 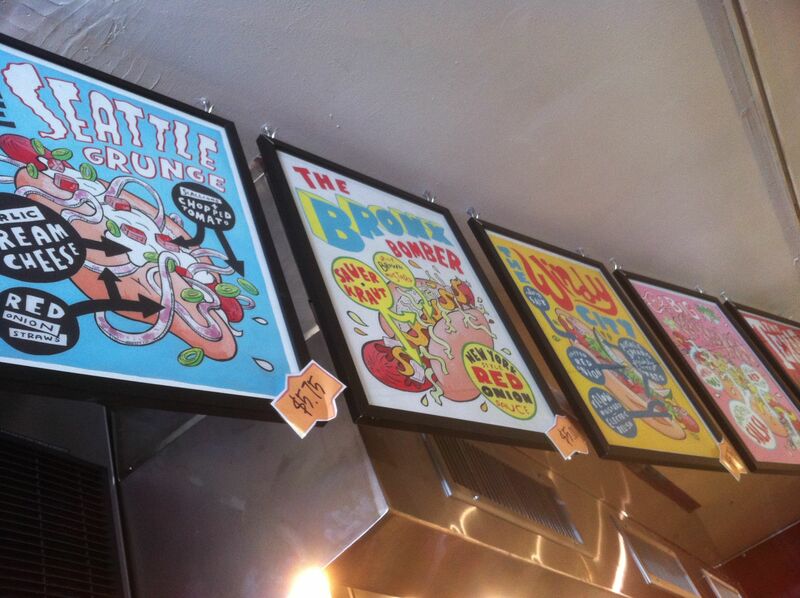 Meanwhile, I scoped the awesome illustrated menu by local artist and food lover, Hawk Krall. I was pretty set on our hot dogs, but I also decided to get fries and had to pick from the looong list of dipping sauces. Fun! 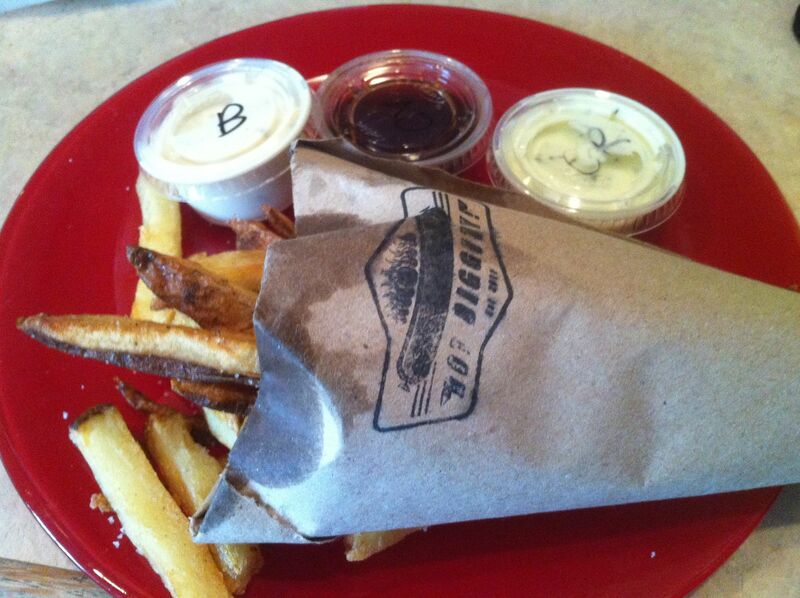 I love me a good dipping sauce! Decisions, decisions!!! Eek, I just didn’t know what to do. I ended up going with the bacon aioli, chipotle malt vinegar and roasted garlic rosemary. Luckily, despite the wait to order, my food came up very quickly, even though I had to bag the last of it myself because things seemed a little hectic. We could barely wait to get home and demolish our dogs. 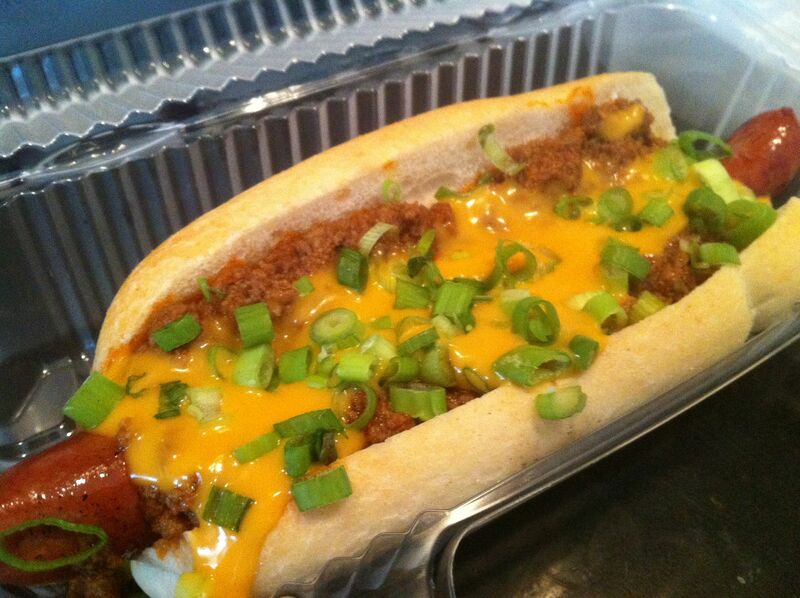 Cincinnati Skyline with chili, white onion, scallions and nacho cheese. Look how long the dog is! This one was the hands down favorite. There was a nice smothering of chili made in-house and the nacho cheese, well, I have a serious affinity for that stuff and a conviction that processed cheese makes almost anything taste better. This dog had a serious tang that hit your taste buds in the back and brought water to your mouth. What a mouthful of flavor. 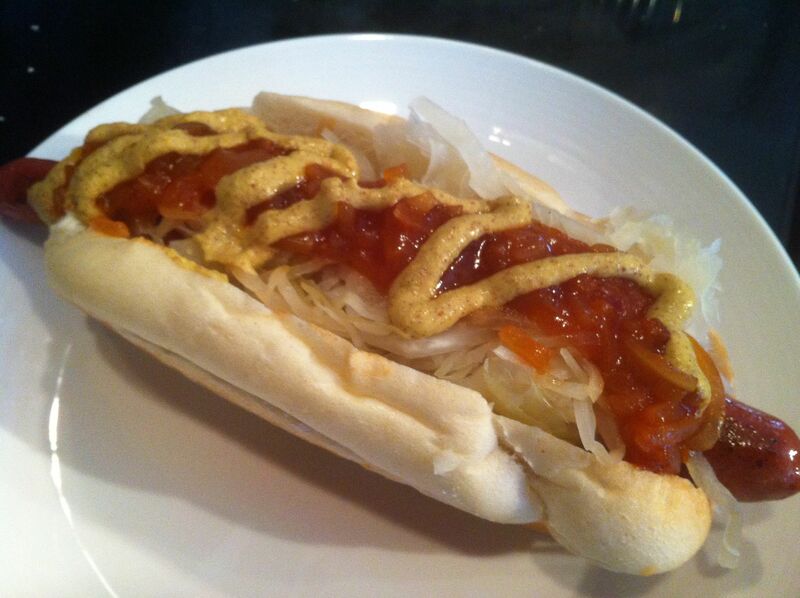 Then again, sauerkraut is up there with processed cheese, although I’m a little more picky about its use. 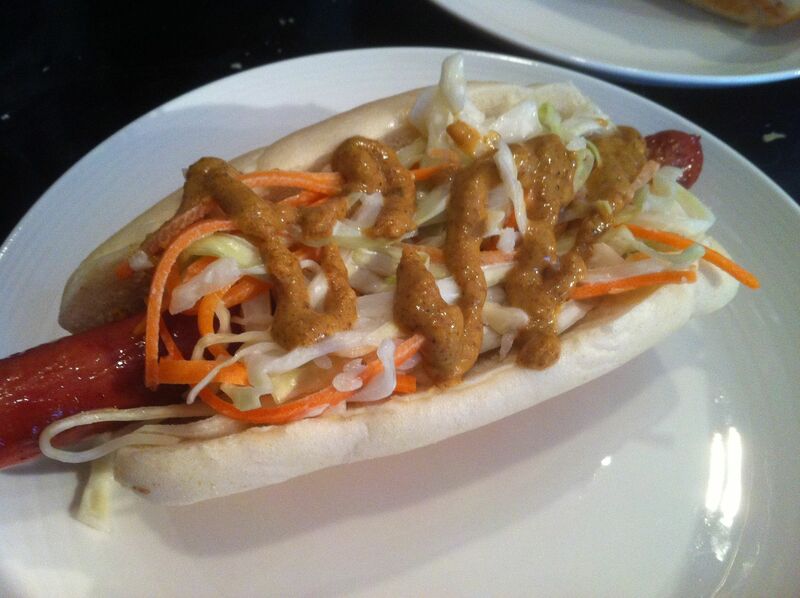 The Southern Comfort with creamy coleslaw and creole mustard. This was the only one that left me slightly disappointed. While it was still one of the better hot dogs I’ve had, I was hoping for a creamier coleslaw. But have no fear, Hot Diggity has absolutely mastered the topping: hot dog: roll ratio. I still enjoyed a little bit of everything in each and every bite and my very lucky dog (real dog, that is) got a taste of the end. She was a happy pup. Oh, the fries. I just love that they’re served in paper cones and when you have you order “for here,” they have cute little holes in the table for propping up your fries. These salty, hand cut fries were the best fries I’ve had in a long time. I loved the option of different dipping sauces but have to say that the bacon one was straight up disgusting. My husband thought that roasted rosemary garlic had too strong of a rosemary flavor but I loved the creaminess and the chipotle malt vinegar lacked spice but all I really cared about was the vinegar which is just SO darn good with fries. We should eat like the British more often. Bottom line. 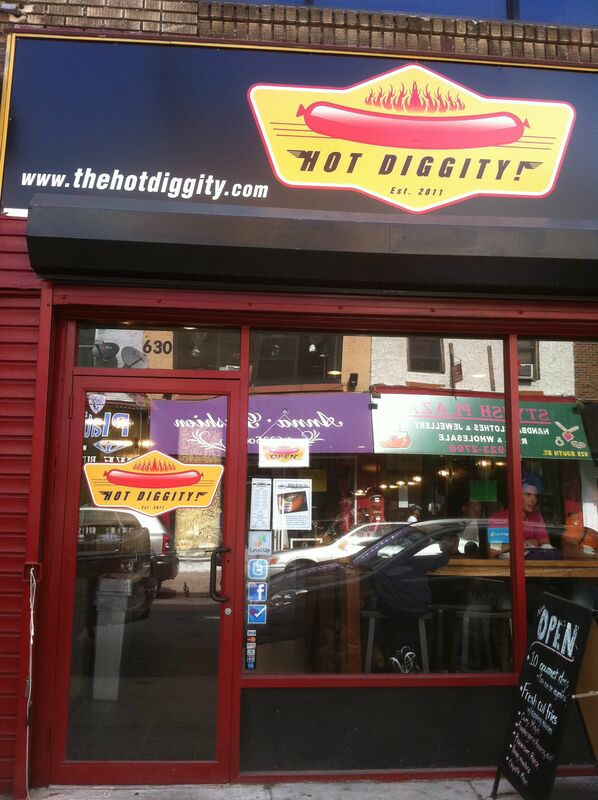 Eat at Hot Diggity. Like, now-ish. Besides, I heard they’re starting a delivery service. As my friend, Mellody Brewing,said, this could be very good for me. And very bad for me. I still need to try out this place! I don’t live all that far from there, but I don’t go over in that direction often. Thanks for the review! Now that the weather is getting cooler, I think a walk over there for lunch one weekend may be in order! I’m not down there often enough, either, but OMG that looks amazing!! 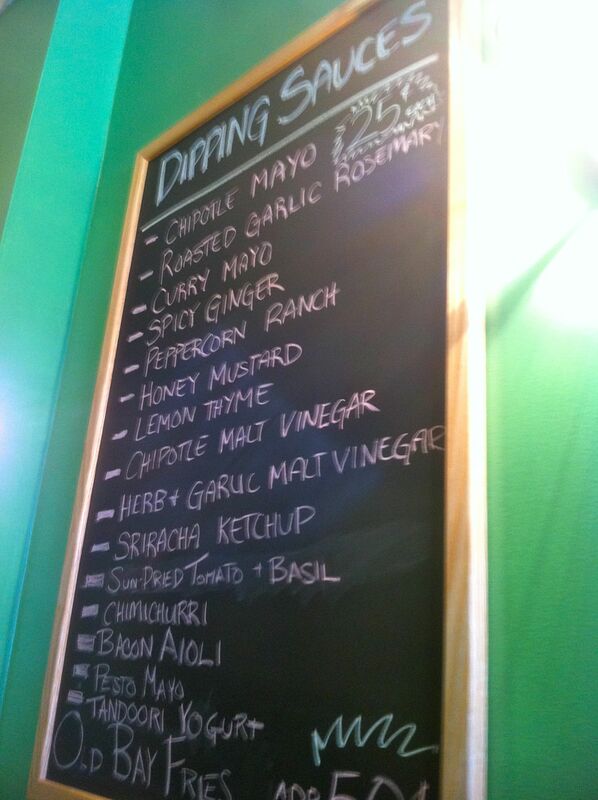 The dipping sauces alone are making me wonder when I’ll have time to drop by (chipotle mayo? yes please!) That’s awesome!